Owning a hermit crab means less mess, less time commitment and less expense than caring for other, furry pets. They don't make any noise and you can even decorate their shell to suit their personality. Overall, hermit crabs certainly make for interesting conversation pieces, but if your little buddy becomes lethargic, it's time to get serious about making him happy again. Getting your pet hermit crab to be more active requires you to give it a clean, healthy environment so it can thrive. Ensure that you are giving your hermit crab enough space for its size. A general rule of thumb is to provide one gallon of tank size for every two hermit crabs. Therefore, if you have six hermit crabs, they should live in a tank that is at least three gallons big. This will prevent your pets from becoming overcrowded and gives them plenty of room to explore on their own. Provide lots of items within the tank for them to explore. Hermit crabs like to forage by nature, so give them lots of driftwood, coral and rocks to simulate their natural environment. Not only will this keep your hermit crabs interested in their home, it will make for a more attractive environment for you to display your little friends. Since hermit crabs begin to hibernate below 60 degrees Fahrenheit, temperature control plays a large part in the activity level of your hermit crab. Provide them with a properly positioned heat lamp so that they are not too cold and not too hot. The ideal temperature zone for a hermit crab is between 70 and 75 degrees Fahrenheit. Be sure to remove them out of direct air-conditioning as well as out of direct sunlight to prevent overheating. Keep a thermometer inside the tank at all times to ensure that there are no temperature fluctuations. Gently bathe or "mist" your hermit crabs with a spray bottle filled with clean water. They'll enjoy the water and may become more active. Hermit crabs generally like warm, moist environments with a relative humidity of 70%, so give them that tropical environment they are used to. 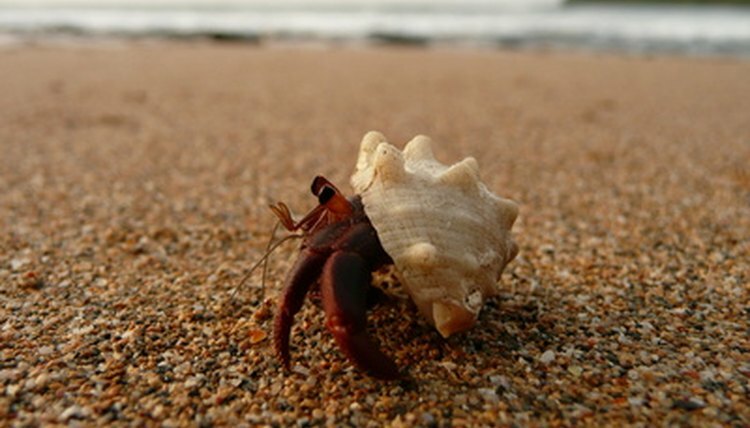 Hermit crabs often like to change homes, so provide lots of variously sized shells for them to "try on" as they grow. Not providing a constant temperature for your hermit crabs between 70 and 75 degrees Fahrenheit can send them into hibernation and even kill them. Dax Wagner has been writing professionally since 1994. His creative work includes "The Bin" for Scanbox International and "Get Out Of Jail Free" for Asylum Entertainment. He has also been a contributor to AOL's Digital City and writes online articles covering various topics from entertainment to personal finance. Wagner received his Bachelor of Arts from the University of Southern California's School of Cinema and Television.